Daphne Odjig, grandmother of Canadian native art, painted long before there was such a thing as a contemporary native art movement on either side of the 49th parallel. Daphne was born in 1919 of Ojibwa/English parents, on the Wikwemikong Reserve on Manitoulin Island. Her mother was an English war bride. Her father could trace his ancestors through the Odawa/Potawatomi tribes. She had always shown an interest in art - encouraged first by her grandfather who was a stone carver - but for years her images were much influenced by an eclectic group of modern European painters. Unable to cope with the discrimination at the time, Daphne Odjig moved to Toronto in 1942, ostensibly to leave her Indian roots behind. She joined the mainstream world in Toronto where she met and married Paul Somerville, moved to Coquitlam and raised two boys. Paul was killed in a car crash in 1960. In the 1960's with the rise of the American Indian Movement and Norval Morrisseau's Toronto triumph, Indian pride was creeping into the Canadian culture like a breath of fresh air. It became easier to be a Canadian with First Nations ancestry and Daphne Odjig began focusing her imagery on the Ojibwa culture she'd left behind. It was during this time she married Chester Beavon. As her work evolved , her images became brightly coloured and highly stylized. Executed with soft flowing contours, the shapes are often outlined in black. In 1967 she had a successful show of 78 works in Port Arthur. By 1971 she and her husband moved to Winnipeg and the following year opened Odjig Prints of Canada Ltd. The shop specialized in native art and crafts and had a publishing arm that specialized in Ojibwa stories and legends directed at young readers. Note: There are various internet references to the shop as the Warehouse Gallery but that is a misnomer. Odjig Prints of Canada Ltd. was in a storefront in an old area of downtown Winnipeg. The rear of the building housed a boxing and wrestling gym. The couple eventually took over that space and renamed the new venture Warehouse Artworks. Gary Scherbain, the Winnipeg free Press reporter who coined the term "Indian Group of Seven" bought the company in 1976. He renamed the business The Wahsa Gallery and operated it until 1984. Sherbain re-opened in 2001 and The Wahsa is currently doing business at The Forks in Winnipeg. In 1973 Daphne Odjig, Jackson Beardy, and Alex Janvier had a group show at the Winnipeg Art Gallery called Treaty Numbers 23, 287, 1171 in reference to the numbers given to their bands when the Canadian government signed treaties and institute the system of Indian Reservations in the country. To follow up on that success, Daphne and Jackson Beardy organized brought together five other First Nations artist to formalize a group with the intention that it would promote native art in Canada and encourage young people towards artistic careers. The groups was called the Indian Professional Artists Inc. 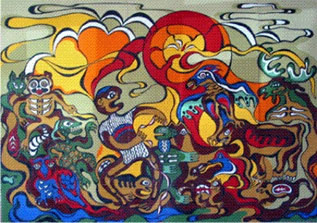 The seven members had a group show in 1973 and Gary Scherbain, a Winnipeg Free Press reviewer coined the phrase "Indian Group of Seven". 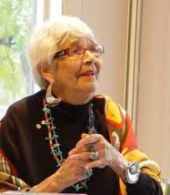 As Daphne Odjig was the only female member of the group she stood out from the men in that her imagery most often emphasized womanhood and family as opposed to native spirituality. In a coup for the feminists among us, Daphne was the first woman to be presented with an Eagle Feather on behalf of the Wikiwemikong Reserve in recognition of her accomplishments. Other awards include the 1986 appointment to the Order of Canada and a 1998 Aboriginal Achievement Award.